Large (up to 5 in. ), Dark red in color with raised bright red spots covering the body and claws and a black wedge-shaped stripe on the top of the abdomen. Occasionally, a genetic mutation may turn the body and/or claws blue. Learn more here. Freshwater marshes, swamps, ponds and slow moving rivers and streams and lakes. 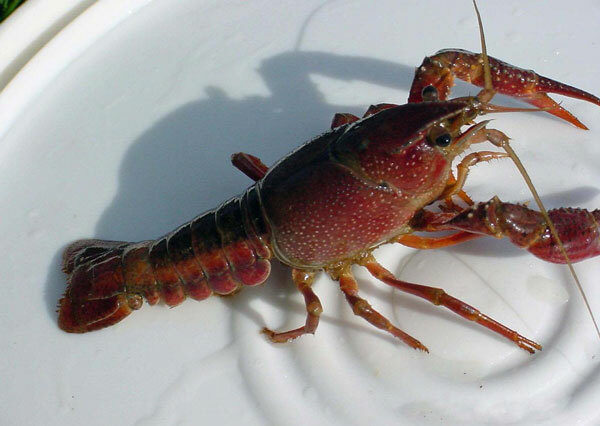 They have been found below Gavins Point Dam (near Yankton, SD) and in waterbodies in southeastern Nebraska. Learn more here. They are used as live bait and can escape or be released into the wild. Schools have used them in classes and they could be released into the wild. The species is used for human food and sold live in markets. This is a prohibited species and it is against regulations in Nebraska to release them into the wild. Feeding on aquatic plants, snails, insects and fish and amphibian eggs and young. They have been found to reduce amphibian populations through direct predation and competition for habitat. 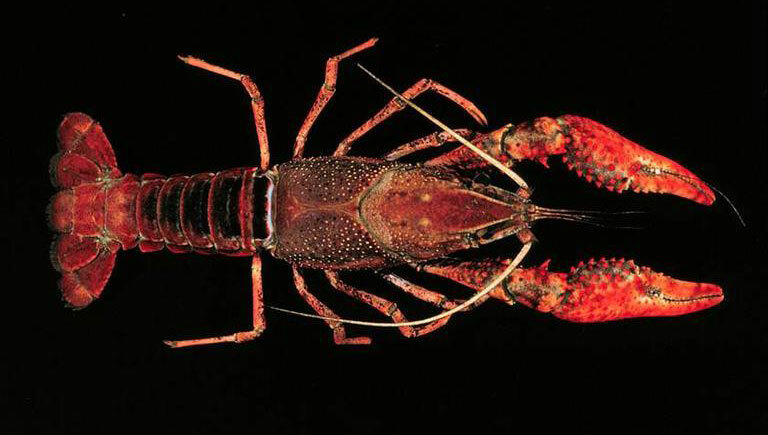 Populations have also led to declines in native crayfish species through competition and because they often carry the crayfish fungus plague.